Why Upgrade Your Server Infrastructure Now? Modern IT organizations are now taking a leading role in driving business outcomes by leveraging capabilities within the cloud, analytics, mobility, and social technologies. The benefits of upgrading server infrastructure on a regular refresh cycle far outweigh the risks. IT managers must consider new technology solutions to help address the demands of their customers. 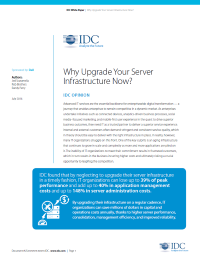 Download this IDC white paper to learn more.